After multiple delays, the city of Chicago is set to move forward with the construction of a new pedestrian 41st Street bridge over lake shore drive. 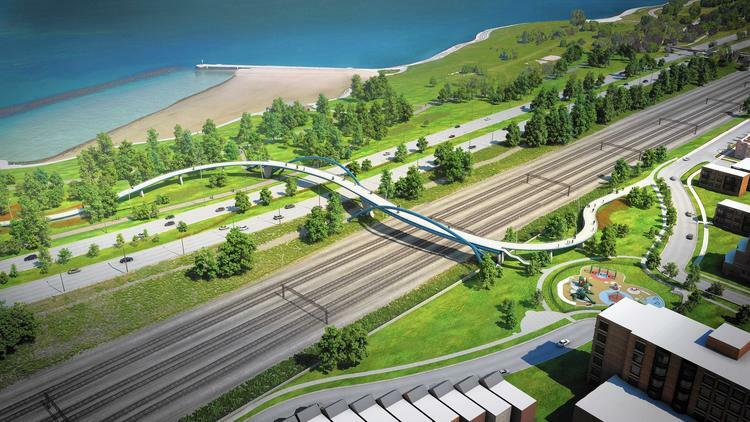 After multiple delays, the City of Chicago is set to move forward with the construction of a new pedestrian bridge over lake shore drive. The 41st Street bridge would connect the Oakland and Bronzeville neighborhoods to the lake over multiple railroad tracks and eight lanes of high-speed traffic. The project, which was initially announced to begin last fall, is part of Mayor Rahm Emanuel’s plan to build multiple Lake Shore Drive pedestrian crossings on the city’s South Side. The new bridge will join a recently completed suspension bridge at 35th Street. In the original announcement of the bridge, a second “twin” bridge was also announced for 43rd street. Aurora, Illinois–based Cordogan, Clark & Associates is responsible for the design of both bridges; the firm's proposal won the “Bridge the Drive” competition in 2004. The bridges will be double-curved mono-truss structures that will echo the curves of the walkways in Burnham Park, where they will land. The building of the bridge highlights the tension between the City of Chicago and the State of Illinois as portion of the money will be coming from the state. Earlier this month plans to move forward with the bridge were delayed due to the state’s refusal to contribute an extra $2 million to the project. Since the initial proposal and budget, the project has seen a sharp rise in estimated cost. Early estimates by the city were 33% lower than the current estimate of around $34 million. Transportation Commissioner Rebekah Scheinfeld told the Chicago Tribune that the city would seek “alternative sources” to fill the funding gap. Currently, a large portion of the money will come from federal and state grants, with the remainder coming from the federal Surface Transportation Program. The F.H. Paschen construction company, who has worked on other projects for the city, was the low bidder at around $29 million. Once a contract with them is reached, the project is expected to begin in late spring. 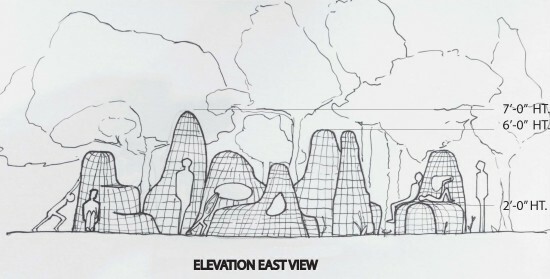 Chicago Mayor Rahm Emanuel, the Chicago Park District ,and the Field Museum of Natural History have revealed five designs that will be implemented along a stretch of South Side lakefront as part of the Field Museum’s “Roots and Routes” initiative. The five “gathering spaces” were the result of an RFP issued by the Park District and the Field Museum to artist and community organizations. Located in the 100-acre ribbon of The Burnham Wildlife Corridor (BWC), the spaces will be integrated into a series of paths which will connect neighboring communities to Lake Michigan through the largest stretch of natural landscape along Chicago’s lakefront. “These gathering spaces along the south lakefront are part of our effort to give children and residents in every neighborhood the opportunity to learn about nature and to enjoy and experience nature right in their own backyard,” said Mayor Rahm Emanuel. 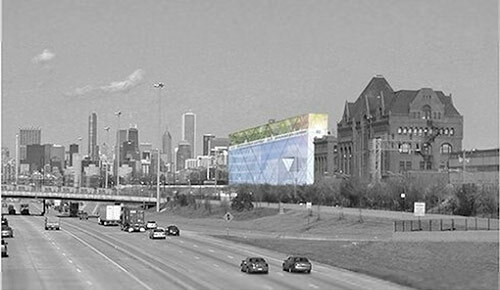 “These unique gathering spaces will add to the vibrancy of Chicago’s south lakefront while helping to inspire the next generation to preserve and protect Chicago’s natural wonders.” The BWC extends from the McCormick Bird Sanctuary, just south of the McCormick Place convention center to the Burnham Sanctuary near 49th Street. “The objective of the Burnham Wildlife Corridor is to create healthy, vibrant and native habitat for migratory birds and other wildlife; and to meaningfully connect visitors, especially those from neighboring communities, to a revitalized public green space in ways that inspire exploration, enjoyment, and stewardship of the area,” said Chicago Park District Superintendent and CEO Mike Kelly. “We are pleased to partner with these organizations to create spaces where community members can gather and take advantage of nature in this bustling city.” The teams involved with the projects include local artists and community organizations, with ties to the Bronzeville, Chinatown, and Pilsen neighborhoods. The organizations include the Chinese-American Museum of Chicago, Bronzeville Community Development Partnership, the South Side Community Art Center, and Pilsen-based Contratiempo and Casa Michoacán. 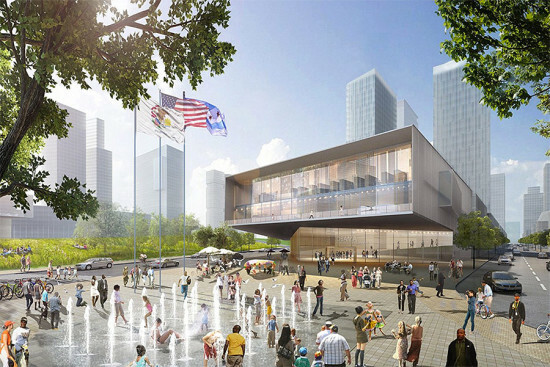 The gathering spaces are also one part of the Mayor’s "Building on Burnham" initiative, a comprehensive plan to invest in the Lakefront, the Chicago River, and recreational areas in neighborhoods throughout city. Preservation projects took home top honors during the architectural portion of this year's Chicago Neighborhood Development Awards (CNDA), exemplifying humanistic design in the too-often overlooked arenas of affordable housing and community development. Established by the Local Initiatives Support Corp. of Chicago (LISC), the CNDA honor achievements in real estate development and design at the community scale—an issue that's taken on some local political significance as challengers to Mayor Rahm Emanuel slam him for neglecting neighborhood development ahead of municipal elections on February 24. The CNDA ceremony was apolitical, however, with Emanuel himself offering a statement ahead of the awards: “When we think about the City of Chicago, we think of more than just downtown–we think of the historic neighborhoods, the diverse families and the vibrant culture that have come to define us.” Emanuel's deputy mayor attended the ceremony in his stead. CNDA presented three Richard H. Driehaus Foundation Awards for Architectural Excellence in Community Design. First place went to the transformation of the Diplomat Hotel into Fred and Pamela Buffett Place, an affordable housing rehab that salvaged an aging SRO in the Lakeview neighborhood. Landon Bone Baker Architects—the team behind similar work at Harvest Commons and on the former site of Cabrini Green's high-rise public housing—recycled old-growth fir for custom benches in the lobby, sprucing up the art deco mid-rise with a green roof and art installations. Weese Langley Weese took second for their conversion of an Albert Kahn auto showroom into Grove Apartments, a winningly modest affordable housing development that enhances walkability in what was once Oak Park's “motor row.” Bronzeville Artist Lofts won third place at the awards for its efforts to revitalize a once humming commercial corridor on the city's near South Side. The 47th Street lofts boast handsome timber beams and dramatic live-work spaces that lend themselves well to a modern, affordable housing rehab. Wrap Architecture revived the 1906 structure, previously Borden's dairy, precluding its demolition. 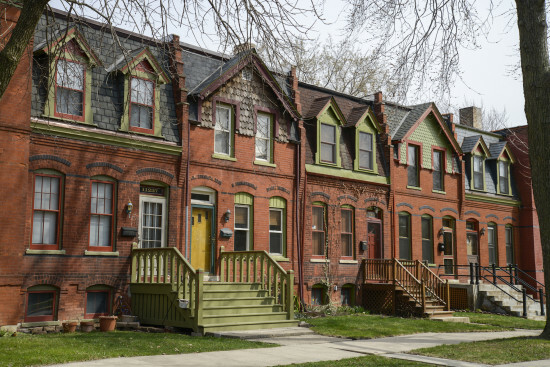 Browse the full list of winners—which includes nods to the Shops and Lofts at 47 and successful efforts to name the historic Pullman neighborhood a national monument—on LISC's website. 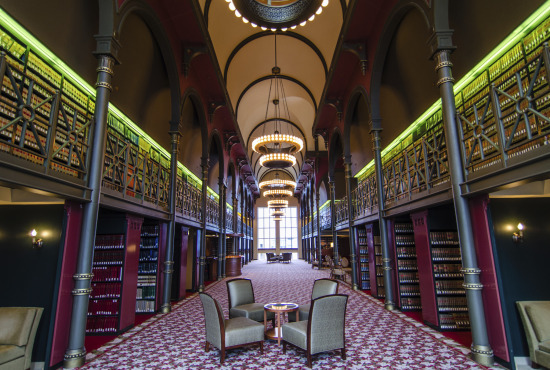 Open House Chicago is this weekend, October 18 and 19, when 150 of the city's architectural gems—both new and old, well-known and obscure, public year-round and off-limits but for now—open their doors to enthusiasts of the built environment, free of charge. Last year's event built on 2012's, the second go-around for this increasingly popular festival of architecture that highlights places and spaces all over the city. Organized by the Chicago Architecture Foundation and sponsored by Kemper, Art Works, ComEd, and CTA, the event generally runs from 9 a.m. to 4:30 p.m. Saturday and Sunday. But hours vary by location, so check beforehand. As always, the sites on display span a wide variety of neighborhoods and building types, from architects' offices to historical relics. A few of the 18 neighborhoods represented are new this year—Ukrainian Village, Edgewater, Goose Island, Bronzeville, Lincoln Square and Ravenswood have all joined the party. If you go, Tweet and Instagram @archpaper with your photos, using the hashtag #OHC2014. 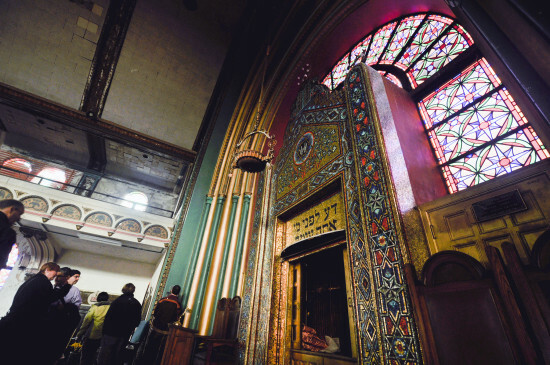 Check out a full list of sites at openhousechicago.org. The Illinois Institute of Technology announced last week that they will break ground next year on a 5-story “innovation center” at the university’s Bronzeville campus in Chicago. The new 100,000-square-foot building will overlook the Dan Ryan Expressway and will house academic classrooms as well as resources for entrepreneurs. “It will combine the power of higher education,” said IIT President John Anderson, “with Chicago-style imagination, determination and boldness to fuel innovation.” The center will house IIT’s Interprofessional Projects Program as well as high-tech workshops and computer labs. IIT will also provide space for companies at University Technology Park. Mayor Rahm Emanuel was present for the announcement, eager to tout Chicago’s growing business community. City support will provide cost savings that Anderson said will translate into twice as many Chicago Public Schools students in its summer programs for high school students.